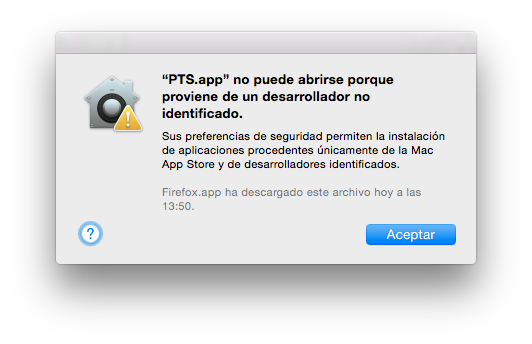 I just installed the PTS app on my Mac, but Mac OS X's Gatekeeper feature prevents me from launching the app. It can be bypassed, but it's a pain and you have to know where to look. Gatekeeper options set to "Mac App Store and identified developers"
Your security preferences allow installation of only apps from the Mac App Store and Identified developers. Safari downloaded this file Date from URL. For apps that are downloaded from places other than the Mac App Store, developers can get a unique Developer ID from Apple and use it to digitally sign their apps. The Developer ID allows Gatekeeper to block apps created by malware developers and verify that apps haven't been tampered with since they were signed. If an app was developed by an unknown developer—one with no Developer ID—or tampered with, Gatekeeper can block the app from being installed. Note: If you have an app that has not been signed with a Developer ID to support Gatekeeper, contact the developer of the app to determine if they offer an update which supports Gatekeeper. Thank you for providing the feedback. 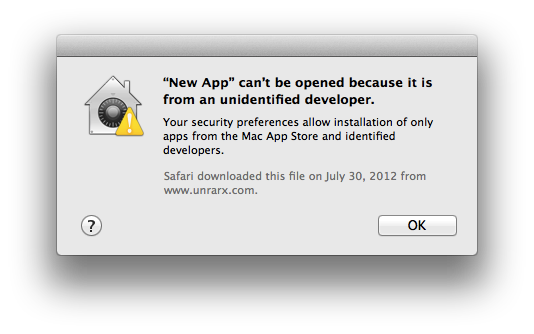 I am not a Mac user and I would not have known that there is this Mac Gatekeeper that keeps out third-party and independently developed apps (apps which are not registered with the Mac Developer Program). While the Gatekeeper keeps aways malwares, it hampers genuine 3rd-party developers. It is certainly inconvenient to new users, especially users with little knowledge of using a Mac computer. 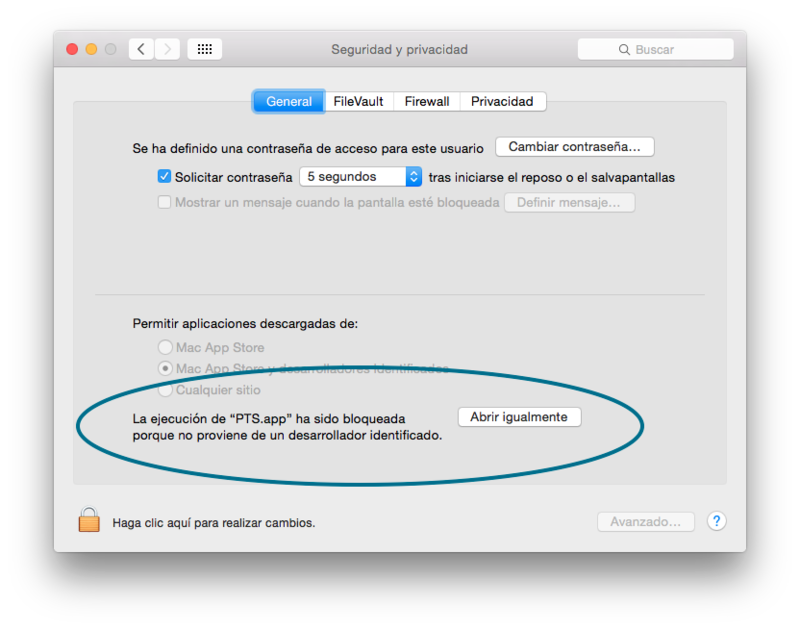 Even though pc (and you) has suggested a way to bypass this Gatekeeper's blockage, I decided to find out more about the 'Official Apple's requirement'. A check with the Apple Mac Dev Programm website (https://developer.apple.com/programs/mac/) shows that it requires an annual subscription fee of USD99/year. As you know, the PTS dev team is working on a full volunteer basis. This means that we need donations for our work and to participate in developer programs like this. I would like to call upon you and those who wish to contribute financially to the PTS development program, please send your donation to ID: bitcube. Edit: On second thought, I think it would be better to have a PTS team account created for donation purposes. I will consult the team on this.